Distraction osteogenesis is a powerful technique for correction of limb-length discrepancies. 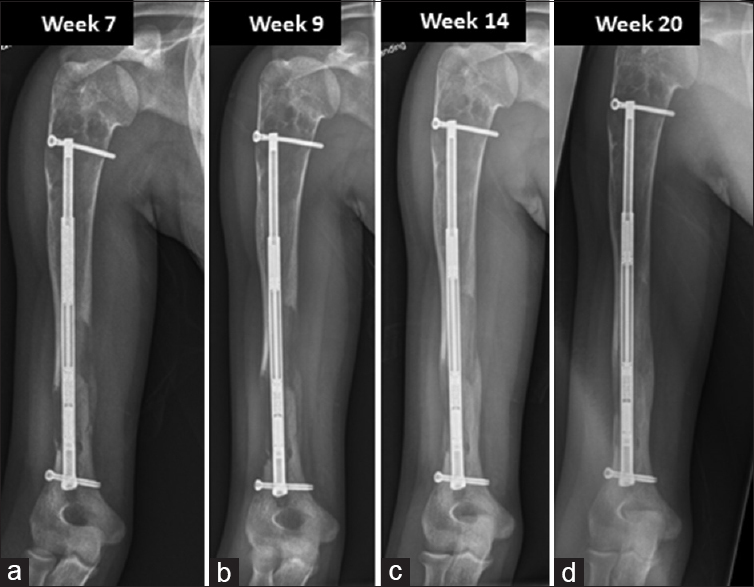 The use of motorized intramedullary nails has allowed for less burdensome lengthening treatment compared to external fixator, with less reported pain and fewer complications. Lengthening of the humerus with motorized nails has been reported through antegrade technique. This is the first report of a retrograde motorized intramedullary lengthening nail used in a humerus. Portions of this case report have been previously published. 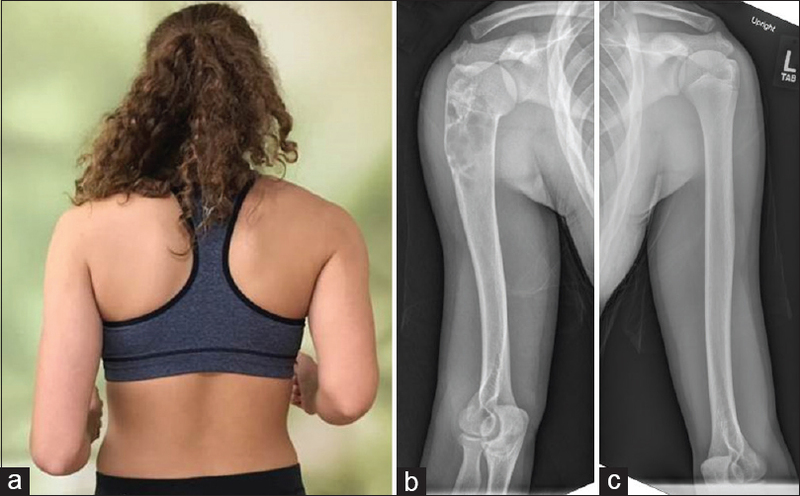 A 13- year-old elite-level volleyball player initially presented for consideration of right humeral lengthening. Examination revealed a right humeral length discrepancy of 75 mm, right shorter than left [Figure 1]a, with normal shoulder and elbow motion. Her history included a traumatic fracture at age 8 through a previously asymptomatic proximal right humeral cyst, resulting in premature closure of her proximal humeral physis before presentation in our clinic. At 14 years of age, her contralateral humerus had further grown, resulting in a discrepancy of 81 mm [Figure 1]b and [Figure 1]c and the family desired lengthening. A retrograde lengthening nail was considered as antegrade nail insertion could result in shoulder dysfunction. Planning included a computed tomography (CT) scan to measure the intramedullary diameter and cortical thickness. The diameter was found to be 10 mm, wide enough to accommodate an 8.5 mm lengthening nail [Figure 2]a. The proximal cortical cyst thickness was sufficient for locking bolt placement [Figure 2]b. Imaging demonstrated that the humerus was too short for the shortest 8 cm stroke lengthening nail, requiring modification intraoperatively [Figure 2]. As part of the shared decision-making process, the patient and her family were offered a retrograde motorized intramedullary lengthening nail. Discussion was held explaining that a nail designed for femoral lengthening would require custom modifications (in an off-label manner) in effort to shorten the femoral nail to accommodate her arm length. Surgery was performed prone through a posterior triceps-splitting approach, as previously described. The radial nerve was identified by palpation 90 mm proximal to the olecranon fossa. The canal was vented at the future corticotomy site, 50 mm proximal to the fossa, with multiple drill holes to prevent fat embolism. An elliptical posterior nail entry window was created with a burr 2 cm proximal to the olecranon fossa. Canal reaming over a guidewire was performed in half-millimeter increments to 11.5 mm to allow insertion of an 8.5 mm diameter femoral PRECICE nail (NuVasive Specialized Orthopedics ®, San Diego, CA, USA). The shortest nail with an 8 cm lengthening capacity has a starting length of 245 mm, which was too long for the patient's humeral canal length, and thus required nail shortening. Fifteen millimeters of nail was removed from each end, leaving one interlocking hole proximally and distally. This was done with a radial saw under constant irrigation using a sterile back table setup. The corticotomy was completed with an osteotome through the obliquely placed vent holes. The corticotomy site was gently moved in valgus and varus under fluoroscopy, avoiding radial nerve stretch, to ensure completion. Nail passage was not possible on the first attempt due to sagittal plane impingement. The entry site was milled dorsally with a rigid reamer, after which the nail was inserted by hand pressure. The corticotomy was manually compressed, and nail locked with a single fully threaded bolt at each end [Figure 3]. The patient was instructed in active shoulder and elbow range of motion, emphasizing elbow extension. Discharge occurred on the 2nd postoperative day using acetaminophen and ice for pain control. A latency period of 5 days was followed by lengthening at 1 mm daily in four doses of 0.25 mm. Radiographs and joint motion were assessed weekly. Corticotomy separation was radiographically evident at 1 week with normotrophic regenerate bone formation. 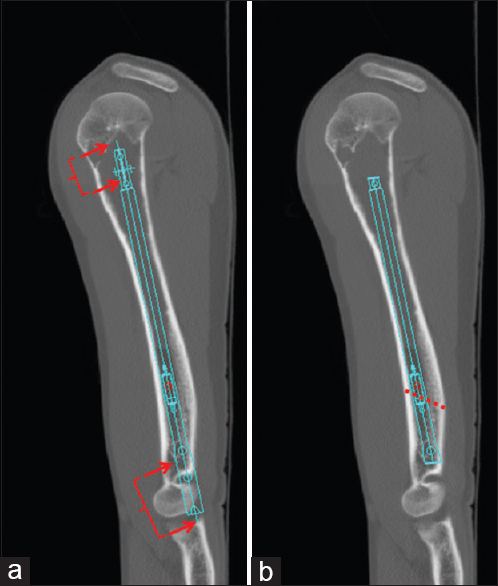 At 4 weeks, with 28 mm of length, the patient developed a 32° elbow flexion contracture, which was improved with intensifying the stretching regimen and changing in lengthening rhythm to 0.12 mm per distraction, eight times per day. 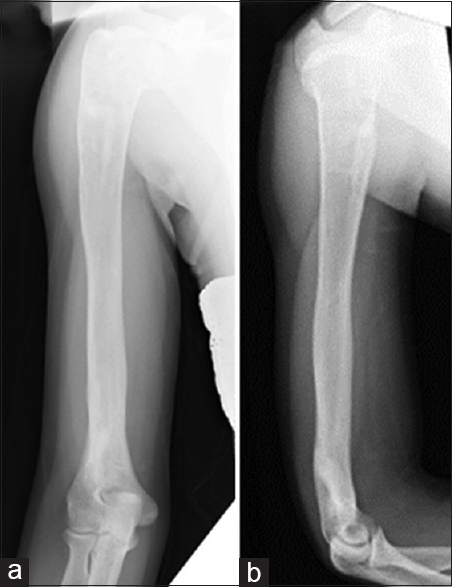 At week 7 [Figure 4]a, with an improved elbow contracture of 17°, she showed signs of hypertrophic bone regenerate, requiring an increased lengthening rate of 1.5 mm/day. The elbow flexion contracture again progressed to 45°, requiring a decrease in lengthening rate at week 9 [Figure 4]b. After achieving 75 mm of length and near equalization, with the contracture persisting at 24°, the lengthening was discontinued at week 11. The elbow flexion contracture resolved by 14 weeks postsurgery [3 weeks after ceasing lengthening, [Figure 4]c. Appropriate regenerate formation was noted at 20 weeks [Figure 4]d.
The nail was removed at 32 weeks, after new cortex had formed all four sides. This was done relatively early to allow for additional consolidation to occur before returning to competition. The removal of the threaded receiver of the nail before insertion made it impossible to remove the nail with a threaded extraction instrument. Removal was therefore, accomplished with a reverse bone hook inserted into the distal locking hole and connected to a vise grip. The proximal humeral bone cyst and entry hole were considered at-risk for fracture. Therefore, a bone void filler was delivered proximally and distally through the nail entry hole. Progressive resistive exercises were prescribed following nail removal, with return to full activity after 8 weeks. The patient maintained full, painless, range of motion of the shoulder and elbow at 2-year follow-up. Postlengthening examination [Figure 5] and radiographs [Figure 6] demonstrate normal motion and good remodeling of the lengthening site. Implantation of a motorized femoral intramedullary lengthening nail in the humerus resulted in normalization of humeral length and preservation of painless function in an overhead athlete. The retrograde approach was selected for nail implantation to minimize the risk of persistent shoulder pain which has been shown in prior studies of antegrade nailing of humeral shaft fractures., The humerus demonstrated abundant healing of the 7.5 cm lengthening site, with four cortices evident. The retrograde use of a femoral motorized lengthening nail requires careful presurgical planning, to measure humeral length and diameter to assess feasibility of nail insertion as well as nail size selection. As the humerus is not cylindrical throughout, CT imaging was obtained to ensure the canal morphology and diameter could accommodate the 8.5 mm nail. In future cases, high-quality AP and lateral humerus radiographs with magnification markers could be considered as an alternative to CT imaging. Reducing nail length and entry diameter were performed intraoperatively, in an off-label fashion, to fit the patient's anatomy. Many experienced motorized lengthening surgeons consider nail removal desirable after four cortices have formed on radiographs, as these nails have mobile components which may cause metallosis, and are not considered magnetic resonance imaging safe. Healing to this extent typically requires 6 months or more for the humerus. We removed this nail at 32 weeks after four cortices had formed and successfully accomplished this despite having removed the threaded insertion for the extraction instrument. Compliance with weekly clinic visits and stretching regimens are imperative to maintain joint range of motion. Modifications to rate and rhythm of lengthening are required to optimize bone regenerate. A prior study of Ilizarov frames used to lengthen humeri showed flexion contractures in 27% and premature consolidation in 23% of cases. Thus, the importance of elbow stretching in humeral lengthening cannot be overemphasized, especially during rapid rates of lengthening. This case shows that a modified straight motorized intramedullary femoral lengthening nail may be successfully used retrograde in the humerus in the selected patient. This work was partially supported by Gillette Children's Hospital Foundation. Mark T. Dahl is a consultant for NuVasive Specialized Orthopedics ®, the manufacturer of the PRECICE lengthening nail. This case involves off-label use of the PRECICE lengthening nail. Kirane YM, Fragomen AT, Rozbruch SR. Precision of the PRECICE internal bone lengthening nail. Clin Orthop Relat Res 2014;472:3869-78. Fürmetz J, Kold S, Schuster N, Wolf F, Thaller PH. Lengthening of the humerus with intramedullary lengthening nails-preliminary report. Strategies Trauma Limb Reconstr 2017;12:99-106. Dahl MT, Green SA, editors. Surgical principles of intramedullary lengthening. In: Intramedullary Limb Lengthening. Gewerbestrasse 11, 6330 Cham Switzerland: Springer International Publishing; 2018. p. 86-8. Fernandez FF, Matschke S, Hülsenbeck A, Egenolf M, Wentzensen A. Five years' clinical experience with the unreamed humeral nail in the treatment of humeral shaft fractures. Injury 2004;35:264-71. Kurtz AM, Rozbruch SR. Humerus lengthening with the PRECICE internal lengthening nail. J Pediatr Orthop 2017;37:e296-300. Ruette P, Lammens J. Humeral lengthening by distraction osteogenesis: A safe procedure? Acta Orthop Belg 2013;79:636-42.